You can configure this block to compute the Discrete Wavelet Transform (DWT) or decompose a broadband signal into a collection of subbands with smaller bandwidths and slower sample rates. The block uses a series of highpass and lowpass FIR filters to repeatedly divide the input frequency range, as illustrated in Wavelet Filter Banks (the Asymmetric one). You can specify the filter bank's highpass and lowpass filters by providing vectors of filter coefficients. You can do so directly on the block mask, or, if you have a Wavelet Toolbox™ license, you can specify wavelet-based filters by selecting a wavelet from the Filter parameter. You must set the filter bank structure to asymmetric or symmetric, and specify the number of levels in the filter bank. Set the boundary condition of the dwt function to zero-padding. To do so, type dwtmode('zpd') at the MATLAB® command line. To match the latency of the block (implemented using FIR filters), add zeros to the input of the dwt function. The number of zeros you add must be equal to the half-length of the filter. Input must be a vector or matrix. The input frame size must be a multiple of 2n, where n is the number of filter bank levels. For example, a frame size of 16 would be appropriate for a three-level tree (16 is a multiple of 23). The block always treats input signals as frames and operates along the columns. For an illustration of why the above input requirements exist, see the figure Outputs of a 3-Level Asymmetric Dyadic Analysis Filter Bank. Output parameter setting can be Multiple ports or Single port. When you set the Output parameter to Single port, the block outputs one vector or matrix of concatenated subbands. The following figure illustrates the difference between the two settings for a 3-level asymmetric dyadic analysis filter bank. For an explanation of the illustrated output characteristics, see the table Output Characteristics for an n-Level Dyadic Analysis Filter Bank. For more information about the filter bank levels and structures, see Dyadic Analysis Filter Banks. The following table summarizes the different output characteristics of the block when it is set to output from single or multiple ports. Block concatenates all the subbands into one vector or matrix, and outputs the concatenated subbands from a single output port. 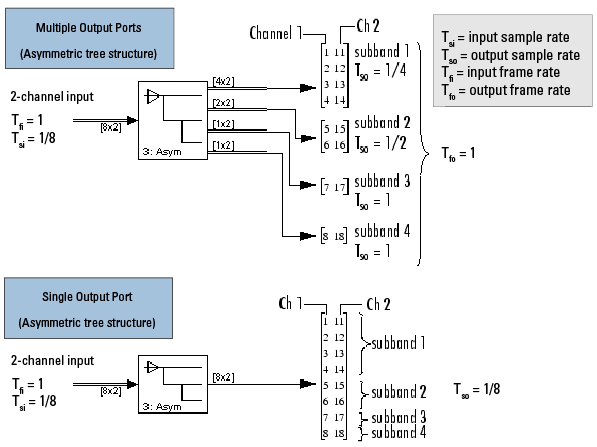 Each output column contains subbands of the corresponding input channel. Block outputs each subband from a separate output port. The topmost port outputs the subband with the highest frequencies. Each output column contains a subband for the corresponding input channel. Same number of rows and columns as the input. Symmetric — All outputs have the frame size, Mi / 2n. Asymmetric — The frame size of each output (except the last) is half that of the output from the previous level. The outputs from the last two output ports have the same frame size since they originate from the same level in the filter bank. Same as input sample rate. Symmetric — All outputs have the sample rate Fsi / 2n. User defined — Allows you to explicitly specify the filters with two vectors of filter coefficients in the Lowpass FIR filter coefficients and Highpass FIR filter coefficients parameters. The block uses the same lowpass and highpass filters throughout the filter bank. The two filters should be halfband filters, where each filter passes the frequency band that the other filter stops. Wavelet such as Biorthogonal or Daubechies — The block uses the specified wavelet to construct the lowpass and highpass filters using the Wavelet Toolbox wfilters function. Depending on the wavelet, the block might enable either the Wavelet order or Filter order [synthesis / analysis] parameter. (The latter parameter allows you to specify different wavelet orders for the analysis and synthesis filter stages.) You must have a Wavelet Toolbox license to use wavelets. The primary application for dyadic analysis filter banks and dyadic synthesis filter banks is coding for data compression using wavelets. At the transmitting end, the output of the dyadic analysis filter bank is fed to a lossy compression scheme, which typically assigns the number of bits for each filter bank output in proportion to the relative energy in that frequency band. This represents the more powerful signal components by a greater number of bits than the less powerful signal components. At the receiving end, the transmission is decoded and fed to a dyadic synthesis filter bank to reconstruct the original signal. The filter coefficients of the complementary analysis and synthesis stages are designed to cancel aliasing introduced by the filtering and resampling. See Calculate Channel Latencies Required for Wavelet Reconstruction for an example using the Dyadic Analysis and Dyadic Synthesis Filter Bank blocks. See the floating-point frame-based version of the DSP System Toolbox Wavelet Reconstruction and Noise Reduction example, which uses the Dyadic Analysis Filter Bank and Dyadic Synthesis Filter Bank blocks. The parameters displayed in the block dialog vary depending on the setting of the Filter parameter. Only some of the parameters described below are visible in the dialog box at any one time. Select User defined to explicitly specify the filter coefficients in the Lowpass FIR filter coefficients and Highpass FIR filter coefficients parameters. Select a wavelet such as Biorthogonal or Daubechies to specify a wavelet-based filter. The block uses the Wavelet Toolbox wfilters function to construct the filters. Extra parameters such as Wavelet order or Filter order [synthesis / analysis] might become enabled. For a list of the supported wavelets, see Specifying Filters with the Filter Parameter and Related Parameters. A vector of filter coefficients (descending powers of z) that specifies coefficients used by all the lowpass filters in the filter bank. This parameter is enabled when you set Filter to User defined. The lowpass filter should be a half-band filter that passes the frequency band stopped by the filter specified in the Highpass FIR filter coefficients parameter. The default values of this parameter specify a filter based on a Daubechies wavelet with wavelet order 3. A vector of filter coefficients (descending powers of z) that specifies coefficients used by all the highpass filters in the filter bank. This parameter is enabled when you set Filter to User defined. The highpass filter should be a half-band filter that passes the frequency band stopped by the filter specified in the Lowpass FIR filter coefficients parameter. The default values of this parameter specify a filter based on a Daubechies wavelet with wavelet order 3. The order of the wavelet selected in the Filter parameter. This parameter is enabled only when you set Filter to certain types of wavelets, as shown in the Specifying Filters with the Filter Parameter and Related Parameters table. The order of the wavelet for the synthesis and analysis filter stages. For example, when you set the Filter parameter to Biorthogonal and set the Filter order [synthesis / analysis] parameter to [2 / 6], the block calls the wfilters function with input argument 'bior2.6'. This parameter is enabled only when you set Filter to certain types of wavelets, as shown in Specifying Filters with the Filter Parameter and Related Parameters. The number of filter bank levels. An n-level asymmetric structure has n+1 outputs, and an n-level symmetric structure has 2n outputs, as shown in Wavelet Filter Banks. The block's icon changes depending on the value of this parameter. The default setting of this parameter is 2. The structure of the filter bank: Asymmetric, or Symmetric. See Wavelet Filter Banks. The default setting of this parameter is Asymmetric for the Dyadic Analysis Filter Bank block, and Symmetric for the DWT block. Set to Multiple ports to output each output subband on a separate port (the topmost port outputs the subband with the highest frequency band). Set to Single port to concatenate the subbands into one vector or matrix and output the concatenated subbands on a single port. For more information, see Output Characteristics. The default setting of this parameter is Multiple ports for the Dyadic Analysis Filter Bank block, and Single port for the DWT block. Fliege, N. J. Multirate Digital Signal Processing: Multirate Systems, Filter Banks, Wavelets. West Sussex, England: John Wiley & Sons, 1994. Strang, G. and T. Nguyen. Wavelets and Filter Banks. Wellesley, MA: Wellesley-Cambridge Press, 1996. Vaidyanathan, P. P. Multirate Systems and Filter Banks. Englewood Cliffs, NJ: Prentice Hall, 1993.